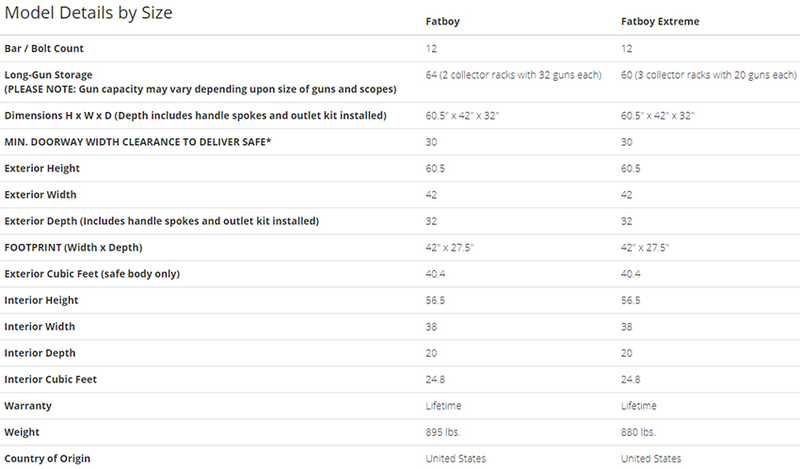 FATBOY safes are the #1 SELLING BIG GUN SAFES IN AMERICA! 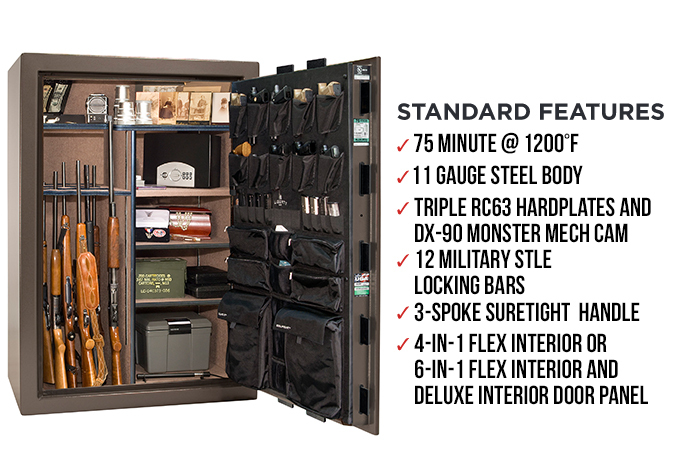 The FATBOY gun safe is one of the largest and toughest security vaults built in America and holds a whopping 64 GUNS! Packed with the same great features as the Franklin Series, the FATBOYS give you excellent security and a whole lot of space and flexibility! And while you're at it, check out the FATBOY EXTREME safe with its 6-in-1 Flex interior along with a 10 pack Rifle Rod kit to pack more long guns in tighter spaces. 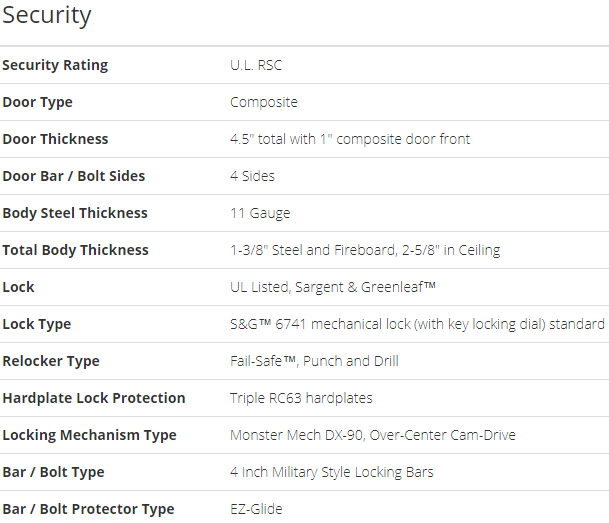 Security features abound with Liberty's DX-90 MONSTER MECH installed on all FATBOY safes. Like the Franklin series, each FATBOY gun safe includes 4-inch military style locking bars, anti pry-tabs and an over-center cam mechanism to discouraging punching. Backed by 83,000 BTU fire protection, this extra large gun safe now has more fireboard than the competition, including 75 minutes @ 1200°F. Liberty's 4-in-1 Flex™ interior with double (FATBOY) or triple (Extreme) collector racks provides the ultimate in storage flexibility. The original, the best, the FATBOYS! Upgraded with Liberty's popular GRAY MARBLE GLOSS finish at NO ADDITIONAL CHARGE *Normally $200. Limited Lifetime Warranty: Liberty Safe and Security Products, Inc. (Liberty) is proud of the workmanship of the product you have just purchased. Liberty warrants that each new safe will be free from defects in material and workmanship for the lifetime of the original purchaser. If there is a defect in either materials or workmanship during your lifetime, we will repair or replace your safe at no cost to purchaser. Liberty will also repair or replace at no cost to the warranted party, any warranted safe that is damaged during a fire, break-in or break-in attempt during the lifetime of the original purchaser if the homeowner’s insurance policy will not cover the damage. The lifetime warranty does not include the lock or painted surface. Lock and Painted Surface Warranty: Locks and painted surfaces are warranted to be free fromdefects in workmanship and materials for a period of five years from the date of purchase. Electrical Items Warranty: Light fixtures, transformers, cords, and light switches are warranted to be free from defects in workmanship and materials for a period of 1 year from the date of purchase. Liberty’s obligation under the Limited Lifetime Warranty is limited to the repair (including labor) or replacement of any product that proves to be defective or damaged during a fire, break-in or break-in attempt, with a product of like size and type. Claims shall be made under this warranty by calling 800-247-5625 or writing to Liberty Safe and Security Products, 1199 West Utah Avenue, Payson, Utah 84651. Any claims made for fire, break-in or break-in attempts must be accompanied by a copy of your homeowners insurance statement of coverage, and a report made by the police. A claim must be made within six months of the break-in. Liberty takes seriously its obligation to stand behind its product with this warranty as long as the safe is properly installed and cared for as instructed in the Owner’s Use and Care Manual. The warranty does not apply to safes or parts that have been misused, neglected or subjected to unusual or extreme conditions and/or environments, or to unreasonable wear and tear. Limitation of Remedies: In no case shall Liberty be liable for any special, incidental, or consequential damages based upon breach of warranty, breach of contract, negligence, strict tort, or any other legal theory. Such damages include, but are not limited to, loss of profits, loss of savings or revenue, loss of the contents of the safe or vault door, loss of use of the safe or vault door, or any associated equipment, cost of capital, cost of any substitute equipment, facilities or services, downtime, the claims of third parties including customers, and injury to property. Changing or modifying the safe in ways that affect its intended use will void this warranty. As a special service to you, the limited lifetime warranty can be transferred to subsequent purchasers or owners with the prior written consent from Liberty. Simply contact our Customer service team with your request. Liberty reserves the right to deny a request or transfer for any reason. Warranty Registration Card: The attached registration card showing the serial number of the product and original purchaser information must be mailed to Liberty within thirty (30) days of purchase to validate this warranty. Online registration must also be completed within (30) days of purchase. Failure to register the product shall void any warranty. No Other Warranties: This agreement is understood to be the complete and exclusive agreement between the parties, superseding all prior agreements, oral or written, and all other communications between the parties relating to the subject matter of this agreement. No employee of Liberty or any other party is authorized to make any warranty in addition to those made in this agreement. THIS WARRANTY PERTAINS ONLY TO THE LIBERTY SAFE ITSELF, AND DOES NOT EXTEND TO THE CONTENTS OF THE SAFE. FOR OPTIMAL SECURITY AND PROTECTION, SAFES SHOULD BE BOLTED TO THE FLOOR. PLEASE REFER TO YOUR USE & CARE MANUAL FOR DETAILS ON ANCHORING YOUR SAFE TO THE FLOOR. THE ABOVE WARRANTY IS IN LIEU OF ALL OTHER WARRANTIES EXPRESSED OR IMPLIED, INCLUDING WARRANTIES OF MERCHANTABILITY AND FITNESS FOR A PARTICULAR PURPOSE, WHICH EXTENDS BEYOND THE WARRANTY SPECIFIED ABOVE, AND IN NO EVENT SHALL THIS WARRANTY BE DEEMED TO COVER INCIDENTAL OR CONSEQUENTIAL DAMAGES OF ANY KIND. Venue and Choice of Law: Any claims arising from this limited warranty shall be resolved in the State of Utah and Utah law will apply to any dispute.